YANGON — Khin Myat Moe is a 4-year-old ethnic Palaung girl born in Nansang in northern Shan State. 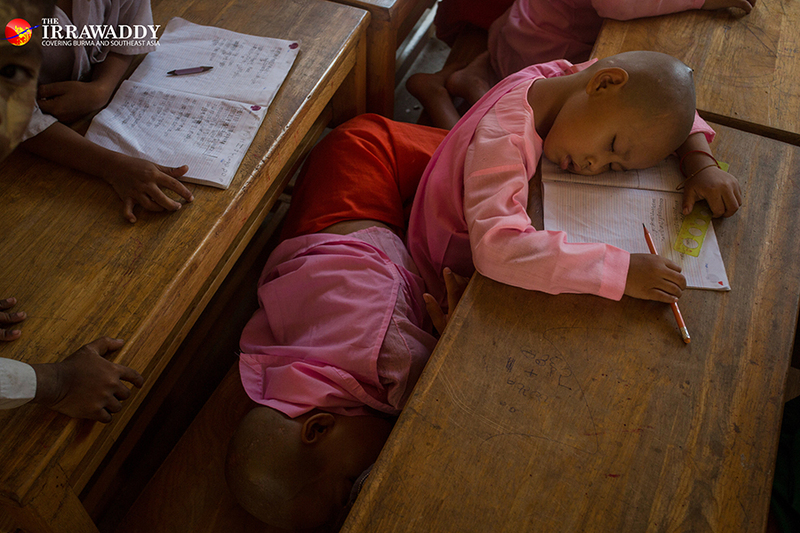 In January, her mother brought her to a Buddhist nunnery in Yangon’s Thanlyin Township. “She lost a lot of weight because of being homesick. She cried a lot and barely ate. She might have felt empty because she is too young to be away from the bosom of her parents,” said Daw Nanda Marlar, a nun at Thadhama Mizu School at the nunnery, describing Khin Myat Moe’s first days there. Khin Myat Moe’s mother was also in a flood of tears as she returned to her town. She brought her daughter to the school because her hometown, Nansang, has become unsafe due to armed clashes and because she wants her daughter to study in a peaceful and safe environment. Khin Myat Moe can study for free at this Buddhist nunnery. Besides Khin Myat Moe, some 400 other Palaung girls have joined the order and are undergoing primary and high school education at three similar schools for Buddhist nuns in Thanlyin, Yangon Region. Daw Kathari, the head of another nunnery school called Kaetharawadi, said her school has helped and taught Palaung girls for more than 30 years. Some nuns left the order and some went back to their hometowns in northern Shan State after they passed their matriculation examinations, she said. “Of course everyone wants to live with their family, but today, parents know that their children must be educated so they bring them here,” she said. Daw Kathari also is an ethnic Palaung from Nansang Township. Due to armed conflict in northern Shan State, every year hundreds of Palaung children, deprived of the simple pleasure of family life, have to flee to other towns. Young boys of the Palaung community are often faced with finding work in teashops and beer bars in large towns like Lashio, Muse, Mandalay and Yangon. Others join the Buddhist order as novice monks in order to be able to continue their studies. Apart from the dangers of fighting and landmines, there is also a fear of conscription in northern Shan State where a number of ethnic armed groups are based. This is why many poor Palaung parents are sending their daughters to nunneries where they can study for free. The youngest girls to arrive at the nunnery are just three years old. Nunneries have a rule that girls older than five years old must wear nun’s habit, the pink-colored robe. This is just one rule in the strict code of conduct which the young girls must follow to make it easier to be raised as nuns. Wearing the nun’s habit, Palaung girls study from primary to matriculation at the nunneries. The standard public school curriculum is taught at the nunneries, which are part of a monastic school education system, a traditional education system that dates back to the monarchical period. The Ministry of Religious Affairs and Culture provides some funds which are supplemented by the nunneries in order to pay the teachers’ salaries. The convent schools also arrange private tuition for students preparing for matriculation exams. The young girls not only have to learn their school subjects; they also have to follow the religious codes of conduct for nuns and help with daily chores around the nunneries. 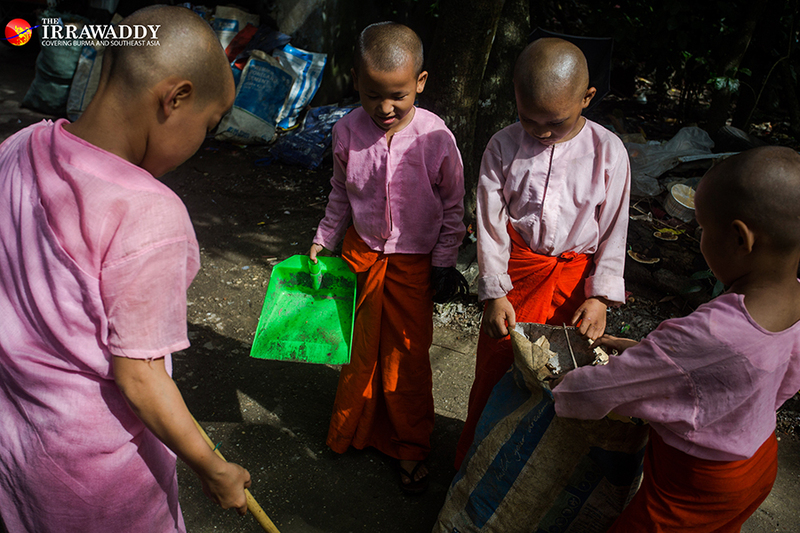 Either on weekends or the day before the Buddhist Sabbath day, they go outside collecting alms. Nunneries have to rely on food supplies given by donors and use the money and rice which nuns get on their alms rounds for the healthcare and education of those who board at the convent schools. Nuns who are very young, and who are attending 10th grade and matriculation years do not have to go for alms collections or do daily chores at the nunneries. When she was six years old she ran away from the nunnery because of overwhelming homesickness. But today, it has become a second home for her. “I will go back home after sitting my matriculation exam. I have been back home twice since I arrived here,” she said. Almost all the Palaung nuns have a dream of going back home after taking their matriculation examination. Most of the Palaung girls at the nunneries in Thanlyin are the children of tea growers. “Many Palaung people have had to move to towns in lower Myanmar leaving their homes and farms behind,” said Daw Kathari. There are public schools in Nansang, but parents are worried about the safety of their children who often have to travel along forest routes, which are notorious for landmines and armed attacks, to get to their schools. “When we were young, rebel groups would only recruit those who were willing to join them. But it is different now. They force conscription. If a family has two sons, one has to join them. If there is no son, the daughter has to join,” said the nun. The more clashes that happen, the higher the number of children who arrive in Thanlyin, said Daw Kathari. Over 60 Palaung girls have arrived at the nunneries in Thanlyin since January this year. Almost all the girls go back to their native towns after they pass the matriculation exam, said Daw Kathari. Some of them remain as nuns after the go home, and some disrobe and get married, she said. Five nuns from the Thanlyin nunneries have joined the Ta’ang National Liberation Army (TNLA) in order to undergo medical training provided by the group. Ta’ang is the word the Palaung use to refer to themselves in their own language. “They said the rebel group provided them with 18 months of medical training. They don’t have as much medical knowledge as doctors, but can provide some medical services in their community. They said they had to serve [with the TNLA] for five years. They have been dispatched to remote areas. At least this is taking care of the health of Palaung people,” said Daw Kathari. Some others underwent training provided by the health ministry and have become nurses, she said. “It has been around 20 years without stability [in regions where the Palaung live]. If there is peace, children won’t have to come here,” she said. Northern Shan State is the most militarily hostile area in Myanmar where the Tatmadaw (Myanmar military), ethnic armed groups and people’s militias are based. The area is riddled with political and racial conflicts as well as territorial interests of the ethnic armed groups. While well-off families face extortion of their money from various groups, poor families have to bear various human rights violations including conscription and forced labor. As long as armed conflicts exist, Palaung girls in northern Shan State will have to spend their lives in nunneries in order to receive an education.